Preheat the oven to 375°F | 190°C. Remove beets leaves and put aside. Wash beets and cut off the end bits, there is no need to peel the beets. Cut beets into 4 cm cubes and spread on a baking dish. Coat with olive oil, salt & pepper. Roast for 40 minutes, turning once or twice, until the beets are soft and cooked through. While the beets cook, wash & pat dry the beet and kale leaves. Remove the stems from the kale and discard, finely chop the leaves. Thinly slice the beet leaves. Place all the greens in a large bowl. In a small bowl combine the olive oil, lemon juice, finely chopped garlic cloves, salt & pepper. Stir to combine and adjust to taste, if desired. Pour dressing over beet & kale leaves and massage into the leaves with your hands to ensure it is well coated. Note: Don’t wait to add the dressing, the earlier you put it on the greens the better as it will soften them so they are tastier and easier to digest. Place chopped walnuts in a dry fry pan on medium-high heat. There is no need to add any oil to the pan as the nuts have enough oil on their own to cook. Toast for 5-7 minutes, stirring frequently, until nuts turn golden. 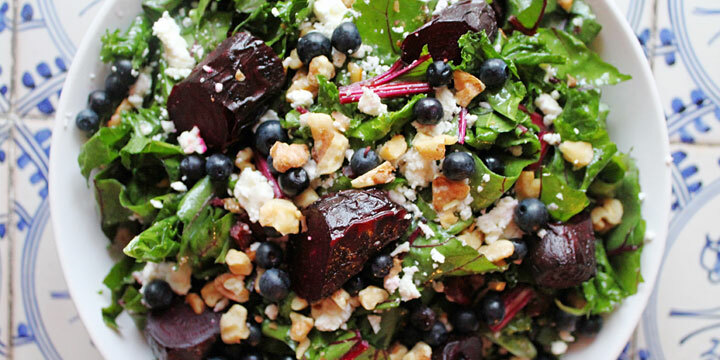 Top greens with roasted beets, toasted walnuts, blueberries and crumbled feta cheese.